We live in a world where our pocket-sized supercomputers tell us the best place to have dinner, how to get there, and what the traffic is like, while our cars have sensors that warn us not to back in to the fire hydrant at the end of the driveway on our way out. With all of the technology that surrounds us and directs us through our daily life, it is a shame to know that the visually impaired, the people who need direction the most, largely still depend on the use of canes and service animals to navigate. MIT named Anirudh Sharma as Indian Innovator of the Year under age 35 for his “Le Chal” project. Anirudh Sharma, a 24 year old researcher in Bangalore, India, made it his goal to change that. 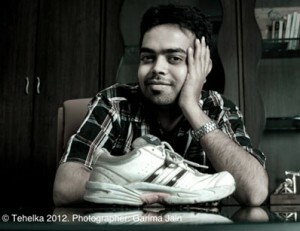 He has designed the first low-cost, unobtrusive, haptic shoe for the blind. The project has been eloquently named “Le Chal” which is a Hindi translation of “Take Me There”. The shoe works in partnership with a smartphone application which can use Bluetooth to connect any GPS enabled smartphone to the shoe. The shoe itself contains small vibrational actuators on each side, as well as proximity sensors, and is powered by an Arduino Lilypad, all of which are located in the interior of a completely normal looking shoe. The user speaks his desired destination into the voice activated smartphone app, which finds the best route via the phone’s GPS system, and gives the user vibrational cues on how to get there. Also, when the user comes within proximity of an object that could obstruct his path, the actuators on that side of the shoe begin to vibrate, getting stronger at closer range, alerting the user of the object’s location and the direction to navigate around it. Possibly the best part of this system is how unobtrusive it is. The visually-impaired rely on their sense of hearing to understand what is going on around them, so a directional assistive device that used vocal or sound cues would impede upon that. The quiet vibrational cues free up the rest of the user’s senses. This product is still in the testing phase and is projected to be released before the end of 2013. If testing goes well, this innovative product has the possibility to free the visually-impaired from their canes and service animals within certain environments, making them feel empowered and independent. However, some places (specifically many large US cities) are not built to be very pedestrian-friendly, and a service animal would likely remain the safest means of navigation. But, having the freedom to make that choice, and to travel safely and independently in pedestrian-friendly areas is a significant step in the right direction for the visually impaired.